With a better understanding of injury pattern, the treatment of flail chest has greatly evolved from placing towel clips on broken segments to orotracheal intubation with positive pressure ventilation to pneumatically stent the ribcage to modern surgical fixation of the segments. Flail chest variations include posterior flail segments, anterior flail segments, and flail including the sternum with ribs on both sides of the thoracic cage fractured. Significant force is required to cause this injury. It requires a significant force diffused over a large area of the thorax for flail chest to occur by creating multiple anterior and posterior rib fractures. In the case of osteoporotic ribs, lower forces may cause the injury. In addition to the injury to the chest wall, the amount of injury to the underlying structures, specifically the lungs and heart are more important for the outcome of flail chest. The exact incidence of flail chest is not precisely known. Bimodal distribution has been noted – adults and elderly. Flail chest in a neonate/ child has been reported as a potential marker of child abuse. Preexisting conditions like osteoporosis, total sternectomy, and multiple myeloma, as well as individuals with congenital absence of the sternum can have flail chest with lesser force. There is a history of chest injury and patient presents with severe chest pain and difficulty in breathing. 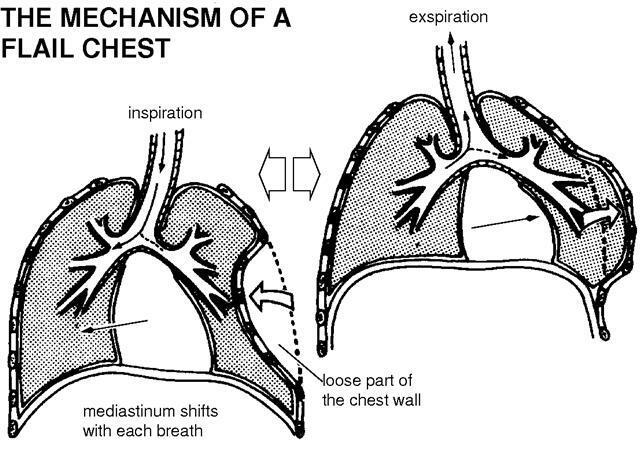 Paradoxical or reverse motion of a chest wall segment while spontaneously breathing suggests flail chest. The inherent structural stability of the chest wall due to the ribs and intercostal muscles usually does not show abnormal or paradoxical motion without 3 or more ribs involved. Therefore if a flail segment is noted on examination, it indicates 3 or more broken ribs. However, the paradoxical movement is not noted after intubation with positive pressure ventilation, which may result in results in a delayed diagnosis. The degree of respiratory insufficiency is typically related to the underlying lung injury, rather than the chest wall abnormality. Lab studies have a role in the management of flail chest and its fallouts but not physiologic abnormalities, but no t in the diagnosis of flail chest. Chest x-rays though are able to show the fractures but may not show all fracture sites. AP or PA chest x-ray is sufficient. Plain films can miss rib fractures and pneumothoraces but id flail chest is clinically observed, the injury pattern should be looked for intently. Saggital and coronal reconstruction of thoracic CT scan can be used to identify the rib fractures and evaluation of other possible injuries as well. Pain control and pulmonary care, including medical management of their pulmonary injury is the standard treatment. Mechanical ventilation is indicated in patients with persistent respiratory insufficiency or failure after good pain control or when the complications associted with drug use occur. Surgical stabilization of the chest, though not routinely performed has found an increased role in recent times. It is worth assertion again that respiratory failure is more due to pulmonary injury than injury to the chest wall. Therefore fixation is not indicated routinely. Requiring a thoracotomy for other reasons or in cases of gross chest wall deformity. Surgical rib fixation has been found to decrease the number of ventilator days by as much four times. 5-10% reported mortality has been reported in patients who reach the hospital alive. The patients who do not need ventilation do better statistically. A higher injury severity score is associated with higher mortality. Kilic D, Findikcioglu A, Akin S, Akay TH, Kupeli E, Aribogan A, et al. Factors affecting morbidity and mortality in flail chest: comparison of anterior and lateral location. Thorac Cardiovasc Surg. 2011 Feb. 59(1):45-8. Tanaka H, Tajimi K, Endoh Y, Kobayashi K. Pneumatic stabilization for flail chest injury: an 11-year study. Surg Today. 2001. 31(1):12-7. Lafferty PM, Anavian J, Will RE, Cole PA. Operative treatment of chest wall injuries: indications, technique, and outcomes. J Bone Joint Surg Am. 2011 Jan 5. 93(1):97-110.